This document is a working draft focusing on technical and engineering issues. It lacks the appeal of good literature: it has been written as a comprehensive background for future essays on the subject. Its value, if any, stays with the exclusive use of primary sources, i.e. Auto Union files, 1938 German newspaper articles, original photos, books by the relevant persons. While data, quotes, and statements are all taken from the above sources (here identified as (*) and to be detailed in the future footnotes), explanations and comments are the author's full responsibility. As a working draft, comments, amendements, additions, critics are welcome. The author apologizes for such an incomplete draft, but he feels compelled to release it to remember Bernd Rosemeyer on the 65th anniversary of his death, at 11.47 in that chilly morning of Friday January 28, 1938. November in Saxony: at Auto Union Rennwagenabteilung (Racing Car Department) in Zwickau, everybody is busy working on the new 3-liter Grand Prix cars for the next season. They just came back full of glory and pride from the October Rekordwoche (Record Week) on the Frankfurt-Darmstadt Reichsautobahn. The 15 world and international records set by Bernd Rosemeyer were, at last, a most sought after reward after a season in which Mercedes-Benz regained its leading edge. On November 27, 1937 a newsflash hits the busy routine of the Department: Mercedes will go for record hunting the following day, on the Frankfurt-Darmstadt motorway(*). Eberan flies immediately to Frankfurt, only to witness an empty Autobahn: no Mercedes in sight. He also learns that they have asked permission to close the Autobahn for records in advance of the 1938 Berlin Auto Show, due to open on February 17. AU cannot stay idle when the gauntlet has been thrown onto the table. They "couldn't allow to see Mercedes-Benz win the records back from AU without any resistance, furthermore as the car, in the Rekordwoche, hadn't yet reached its top speed, estimated at 415 km/h"(*). They switch the focus from the new Grand Prix cars to the improvement of the 1937 streamliner, following the plans already outlined since September together with Dr. Porsche. When Mercedes-Benz announces to be ready to go by the end of January 1938, AU managers feel obliged to share the racecourse. Also because, if running alone, they would have had to pay too many Reichsmark (RM) for renting the closed Autobahn(*). Adolf Huhnlein, the head of NSKK, the German Nazi Motorsports Guild, gives his approval to reserve the racecourse for both companies on Thursday, January 27, free of charge, courtesy of NSKK(*). In the late morning of that rainy and hazy January 27, 1937, the Messerschmitt Me-108 Taifun personally flown by Bernd Rosemeyer lands at Frankfurt airport. No record runs, today, but tomorrow the weather forecast points to a cold and clear day. The date is set. The February 11 internal memo by Eberan(*) provides many details about 1938 Stromlinienwagen, listing the modifications from October 1937. It also clearly lists the main results of wind tunnel measurements. The memo is well known, but from a German archive another version of the same document surfaced with handwritten brackets and the headnote "Dr. Porsche"(*). It could be a deliberate act of censorship: all bracketed words are related to proposals, designs, actions taken by dr. Porsche, the creator of the 1938 car, but no longer associated with it, as his contract with AU had expired at the end of 1937. The latter draft doesn't have any signature, while the already known one is clearly signed by Eberan. The car selected for being transformed into the 1938 model is Wagen 2, driven by Fagioli at Avus 1937 and by Rosemeyer in the June and October record runs. Its body, following Porsche's advice, has been built sturdier and heavier than the first one. The car is a workhorse, extensively tested, reliable, and deeply familiar to the driver. Aiming for higher speed, engine capacity is enlarged to 6.5 l through a 78 mm bore (75 mm in the original 6 l engine). New pistons, liners, heads have to be machined(*). On December 27, on the test bed, the larger engine reaches 560 HP at 4,800-4,900 rpm, a significant improvement over the 525 HP of the 1937 engine. The new, optimal, transmission ratios don't work: they have to select a 31:23 "never used before"(*) and a 15:40 end ratio. Such a ratio selection, using the new 24" wheels translates into 456 km/h at 5,000 rpm. Continental produces new tyres and new 24" wheels, 2" larger than in 1937. The wheel fairings on the 1937 Stromlinienwagen have, therefore, to be reshaped and ground clearance adapted. Stiffer torsion bars are mounted all around. Following new wind tunnel test with a model integrating all body changes, a slightly negative setting is selected to optimize downforce and drag. Engine, final transmission, wheels, tyres, and suspensions make up a totally new, untried system. January 28, 1938. 11.02 h. The car is readied for the start of Run 1. The sun is shining, Bernd ready in the cockpit. The car is in pristine conditions: the upper fairing have been installed. The gaps at the junction with the body are already clearly visible. News on Eyston's land speed record achieved without front air intake and with ice cooling, combined with data from wind tunnel tests, ease the way to the most striking change on the 1938 car: ice cooling, without the radiator. A new 40 kg heavy water tank, holding up to 180 l, replaces the fuel tank behind the driver. To shield him from the heat, a 10 mm asbestos plate is mounted on the front side of the tank. It's a bulky thing, with stiffeners to let it go up to a steam pressure of 2 atm without blowing up. Water pipes to and from the engine are engaged directly to the tank. The front radiator is kept in place. Following wind tunnel data, a set of plates to close the front intake is readied: they could be put in place on L shaped brackets, bolted to the top and the bottom of the nose. The small holes visible in the body, above the intake, should have been drilled for this purpose. The car could run for up to 55 sec without overheating. Through the help of the near freezing temperature of that day, the cooling in Run 1 and 2 has always been nominal. The 6 air outlets on the floorpan are sealed, and three new outlets added in the same 2 mm dural plate. The driver could seal the three new outlets through a shutter, by pushing a pedal. The plate with all 9 outlets is mounted using not less than 28 6 mm screws: a mount which could be more apt to an armoured vehicle than a record car. It's bread and butter for today aerodynamicists that the inner flow in a hi-speed vehicle is more critical, in terms of overall stability and performance, than the outside flow. It's a truism known since the early days of motoring, and routinerly applied in planes, yet it is something undeserving too much attention at the speeds attained by racing cars until late Thirties. Apparently, AU designers and Dr. Porsche put aside any thought on the changes in the inner aerodynamics of a vehicle travelling at 400-plus km/h. It's a typical engineer's approach to rely on the know-how gathered at lower speeds, say at 300 km/h (then already at the reach of a GP racer), and on safety margins built into the system. It could be a safe platform for extrapolating higher performances, if only the modelization was correct: in the 1938 streamliner, this was not the case, due to the lack of computational and measurement tools and to a science still in its infancy. In the real world, jumping from 300 to 400 km/h without an in-depth study of all forces and parameters, is like venturing into outer space on a sailboat. In Runs 1 and 2, the front air intake and the three air outlets were left open, thus preventing any perceivable ground effect because of the vortexes generated by the merging of two airflows at the same temperature, but with different velocity and pressure. Sealing the outlets in Run 3(*) altered profoundly the inner airflow. The air, though reduced by the partial closure of the intake, could now escape only through the gap around the head of the driver and the small openings in the engine bay. The closed outlets also made up the setting for effective downforce: maybe, it was the first time in motoring history in which it was exploited with a significant effect. Once again, the whole system was untried. Yet, AU pushed it into the unknown. The lower and upper fairings were added to the existing body in a modular way by bolting them in place: 20 screws for the upper one, 23 for the lower centre "miniskirt", 12 for the lower rear fin, 5 for the lower front "shaper". 10 mm steel studs, bolted to the inner side of the aluminum body, receive the same 6 mm screws used throughout the car. The sturdiest add-ons are the centre-lower miniskirts: one of them is the only recognizable part in the wreck. The upper fairings had to be taken away to load the car on the transporter. The lower ones were already in position when the car arrived on the Autobahn. Against any rule of good construction, the flush mounting of the upper fairings doesn't use any cover of the junction, to make it smooth and sturdy enough to withstand aerodynamics forces. The upper fairings are shaped from 1 mm aluminum strengthned by an inner structure. They are reported by Eberan as "strong enough to carry the weight of a man either sitting or laying on them"(*). The windshield is changed into a more enveloping shape with a painted upper section. From the photos, it appears rather thin: about 3 mm, like in the past. It worked, and, as such, it never came until scrutiny. Christmas vacations affect the wind tunnel measurement program, to be performed on a 1:2.5 scale model of the new body. Everything seems to have been managed and completed in a hurry, with a lot of frantic work to pay respect to the right of AU and Friedrichshafen wind tunnel staff to stay home for the holidays. The first test session at Friedrichshafen goes non-stop from December 20-22, 1937. Results are beyond the most optimistic forecast: the new body, with closed air intake, shows a 2.72 drag ratio. It was 3.91 on the 1937 body, used as calibration reference(*). But, now, Continental has changed wheel and tyre sizes: a new model is shaped just after Christmas. The next test session takes place from 10-17 January, working every day from 7 to 22 h(*). Again, measurements show that the new body performs much better than the old one: drag is down to 81.5 % (100 % is the measurement taken on 1937 model). Front lift is slightly higher, 106 %, but rear lift is only 22.8 %. The front lift signs a wonderful 0 when only the lower fairings are used: today, we call it downforce due to the ground effect through the use of miniskirt and a correctly shaped underpan. Expected maximum speed in such a configuration: 447 km/h. From January 15-17, sidewind sensitivity is also tested: results are not so encouraging, but they don't come as a complete surprise. Turning the model at 3� and 6� to the airflow, sidewinds as strong as 6,25 and 12,55 m/s are simulated. The body with full fairings shows up to 127.7 % front and 136.4 % rear at 3�, and 125.6 % and 132 % at 6�. (Again, 100 % are the measurements on the reference 1937 body). The decrease at the higher angle is rather surprising, but it could be due to experimental errors and to the known asymmetry of the model. When putting together all forces acting on the vehicle, the new body is 29 % more "sensible", i.e. less stable, than the reference. But it is 7 % faster, with the same 6.5 l engine and wheels/tyres. The decision is taken: despite the alarming figures on sidewind sensitivity, the car will run with upper and lower fairings and closed air intake. The front lift will be reduced through a slightly negative set up. Yet, some doubts linger: the car had also had to be ran with the lower fairings only, just to see as it went: it never happened, on Rosemeyer's will (*). The known version of the February 11 memo, signed by Eberan, as well as the preliminary memo, again by Eberan, dated February 6(*), contains the following sentence: "On the measurement of lateral components taken by Hofst�tter (an engineer of the wind tunnel staff) from January 15-17, 1938, he reported promptly to the Racing Department in Zwickau on January 18, on the basis of the figures he had in his possession. His additional written report is dated January 24, 1938, and yet it has been forwarded by ZKB (the Friedrichshafen wind tunnel organization) to the Racing Department only on February 3, 1938"(*). The sentence is among those bracketed under the heading "Dr. Porsche": did the great man suggest to be very careful in releasing such a set of facts or did he bluntly ask for total censorship? Here, the integrity of the responsible persons at AU takes a round of punches. Wind tunnel tests on lateral components were made on an unsimmetrical model, applying empirical corrections. Variations in the data pattern cried for follow-on and double-checking. It was too late: only 10 days were left before the record runs. On this date (January 18), the new body additions were either fully finished or very close to completion. So, why take additional and costly measurements? The alarming results were reported 10 days before the record runs and 5 days before the shakedown run by Hasse(*), even if only through a telephone call. The official report, dated 4 days before the record runs, was mailed on February 3, when poor Bernd already laid in the grave. Should a phone call, reporting figures by heart, be an excuse for not dwelling on unsettling facts? And why was the written report kept in Friedrichshafen for 11 days? To let someone in Zwickau, after the accident, say: "I didn't know it. I didn't have a full set of reliable data. I only knew that the car was faster"? 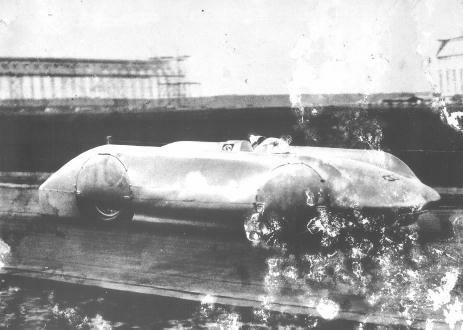 The car carries full fairings, as in the earlier runs, in accordance with Rosemeyer's will not to waste time with options known to cause slower speeds. The front intake surface is reduced installing a plate with a small opening "to allow the flow of air to the engine and driver's compartment"(*). Such a closing plate was still in place after the crash. All the air escape outlets in the floorpan are closed. All the screws of the fairings have been tightened. Tyres are still good and left unchanged. The ice and fuel tanks have been topped. Actually, working at the freezing temperatures of that day, the mechanics simply poured in the water from the canisters they had there. The car started Run 3 at 11.46, at the nominal weight of 1,247 kg, driver included (80 kg). 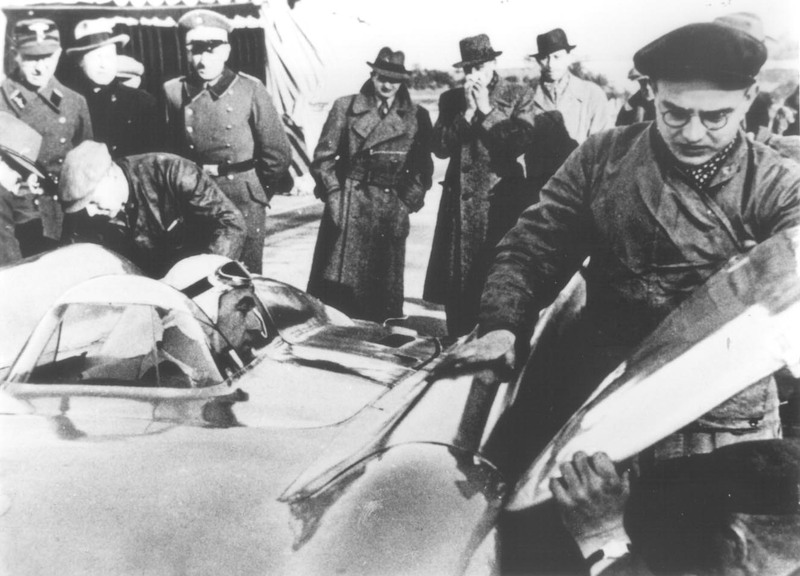 Bernd Rosemeyer was left with only about 90 second of life. The car entered the measured km (at km 7.6) at 11.47'18" exiting at 11.47'26". The performance on the flying start km was 8"38 = 429.491 km/h (Note 1). The car never went through the thread at the end of the measured mile, laid across the track at km 9.2. Weather readings were not in the AU checklist during the record days. An internal memo dated February 2, signed by Herr Keller(*) has a footnote: "The (Frankfurt Airport Meteorogical) Office reported that on that day (i.e., January 28) MB (Mercedes-Benz) asked for weather reports. AU could have received the same information if it had asked for it". On February 3(*), the Frankfurt Weather Office mails AU the same words dictated over the telephone the day before: at 30 m over the ground, from 11 to 12.30, on January 28, the strongest wind, blowing from South-West, was recorded at 11 m/s, while the mean value was 8 m/s. Another undated AU memo(*) mentions a Herr Topf reporting over the phone the wind force: Frankfurt Airport, 11-12.30 h, maximum 11 m/s, mean value 6 m/s; Darmstadt Airport, 9.45-12 h, maximum 6 m/s, mean value 3 m/s. On February 2, Alfred Neubauer informs Mr. Uhlenhaut and Mr. Krauss on the AU runs on January 28(*). The man was known for his immense skill in finding the right information everywhere. He has already gathered Frankfurt weather data and he writes: wind speed measured at 36 m over the ground, from 11.30 to 12.30, 9 m/s; maximum value between 11.40 and 11.50: 10.5 m/s. (Rosemeyer started Run 3 at 11.46). A fully indipendent source, the Frankfurter Zeitung, January 29 edition, lists the weather recorded at 10.30 the day before(*): "Frankfurt, SW wind, force 2; cloudly; temperature - 1 �C". A force 2 wind is barely stronger than a breeze. Taking the strongest gust at 11.40 (10.5 m/s), assuming it in a perfectly southwesternly direction (225�), and knowing that the Autobahn has a 353� orientation(*), the lateral component of such a front gust, when hitting a moving body, is equivalent to about 8.2 m/s (29.5 km/h), while the nosewind is worth about 6.5 m/s (23.4 km/h). Yet, all these data are meaningless for the record runs, because they have been measured at 30-36 m over the ground in the open space of an airport, 6 km away. Furthermore, Darmstadt data indicate more a breeze rather than a wind, like downtown Frankfurt's. It's nonsense to apply these data to a 94 m clearing in the middle of a forest and to a body travelling at 430 km/h on a motorway raised 3 m over the ground level of the forest. Turbolences are unpredictable in a forest, but it's also hard to believe that the clearing acted like a venturi tube, accelerating the sidewind. There was a wind of totally unknown force at the M�rfelden clearing, that day. Knowing wind tunnel results, it could have been strong enough to worsen the lateral sensitivity of the car beyond the alarm threshold. However, it wasn't a gale strong enough to destroy a car, at any speed. The two eyewitnesses who cared to inform AU of their knowledge of the facts are both officials of the timekeeping team: they were on the spot, at the end of the measured mile. Otto Geyer(*) writes that, already in northbound Run 2 the car looked unstable, travelling close to the grass median. About Run 3, he adds to have heard an "explosion" when the left rear wheel of the car touched the grass. He also believes that Rosemeyer applied the brakes. Carlo Wiedman, head of the timekeeping team, writes(*) that, before the M�rfelden clearing, Rosemeyer eased the car to the right as to leave himself more room on the concrete on his left, ready to counterbalance the sidewind expected from his right hand side. Yet, the car went with the left wheels half a meter inside the grass median. Wiedman is clearcut on Rosemeyer's frantic action to save his soul: "With the bridge only 400 m away, he tried with any means, by countersteering and braking (see braking marks on the track), to aim through the bridge with the car intact". Those weren't the best years for inquisitive reporting. Saturday, January 29 dailies write about the death of a hero, and only a few (at least, of those still available today) venture into a description of the accident. The local daily, Frankfurter Zeitung, publishes a detailed report(*): for the journalist, there are no doubts that the wind gust triggered the "wide open" skid to the left. There is quite an interesting line: "After having hit a picket in the grass median, the car went on again, back on the concrete track, as one can see from the black marks"
The Kurhessiche Landeszeitung(*) has a long quote attributed to an unnamed first-aid man at that fateful km 9.2. The man is quite shocked and reports on two wind gusts: the first one forcing the car on the grass median, the second one triggering the deadly skid, after the car was back on the concrete track. The Neueste Zeitung Illustrierte Tageszeitung(*) publishes an article of unexpected detail, written by a knowledgeable person, albeit unknown. He wasn't on the spot, and he is wrong when he writes of the second run, pointing North, while it was Run 3, southbound. He also mixes up the right and left wheels of the upside-down wreck. Nevertheless, he explains in plain words how longitudinal stability is worsened by an increase in front drag and how any side force has a stronger impact as higher is the speed. The closing of the article reads: "On this event, not even a master like Rosemeyer managed to win over the forces of nature". Alexander B�ttner, a professional photographer and journalist living in Karlsruhe, took a well-known photo right after the start of Run 3: it shows "strange" reflections on the right upper fairing, which was said to be warped. The photo was published by the magazine Deutsche Sport Illustrierte, February 8, and immediately started some commotion. AU reacted quickly, calling Herr B�ttner and obtaining his agreement to say, even under oath, that the Stromlinienwagen body was in perfect shape at the start of Run 3(*). They bought the film and got an affidavit by him stating that no warps were on the body, but only reflexes of light, and that no, he didn't even see them until some third party pointed them out to him. They also agreed he would say to have immediately discarded such a vicious gossip and that, by the way, yes, he had mailed the photo to Stuttgart (guess whom!) ten days earlier, but without any malicious caption. He will also have to stop submitting his photos to dailies and magazines(*). After such a victory on a paparazzo, AU wanted to win all over the line: they clad the right side of the surviving Stromlinienwagen with upper fairings � la January 28 car and shot photos from the same angle as B�ttner did, in the snow covered yard of the plant. They silenced everybody with those laughable photos, showing reflections quite similars to the alleged warps, and the "scandal" was hushed up before it could became really dangerous. The caption on B�ttner's photo is false, because after a few meters from the push start, the speed of the car is still too low to build up an air pressure strong enough to warp the side panels. The truth is that the right side panel of the car was warped at the start: no doubt. There is a dip around each screw, which appears to have been tightened too strongly, thus stressing the whole surface of thin 1 mm aluminum, no longer flush with the side of the body. Wavelike warps, as well as differences in the reflective power, are clearly visible in the last photo of Rosemeyer, showing his tense face when the car is turned to head South at the start of Run 3. Looking at the photo at the start of southbound Run 1, when the car was still in pristine conditions, the joint between the fairing and the body is straight and smooth: reflections are regular. A third photo, probably never unveiled before, shows the car at the arrival of the northbound Run 2, with Frankfurt airport in the background. The right side shows wavelike warps and reflections quite close to those appearing in B�ttner's photo. The photo of the warped side triggers a weird reaction by AU. Around mid-February, all people attending the January 28 runs are summoned to the company lawyer and asked to sign an affidavit: Karl Feuerreissen (team manager), August Jacob (chief engineer); Robert Eberan von Eberhost (director of racing car development); Wilhelm Sebastian (director of racing car production); eight mechanics including Bernd's crew chief, Ludwig Sebastian. They all agree on the spotless condition of the car body at the start of Run 3. Jacob writes something significant in his affidavit(*): "I came back to km 8.55 to better check the beginning of the marks of the deviation from the straight trajectory, which aimed at the grass median. The marks were so faint and barely visible that neither I nor the Police managed to ascertain the progression of the skid. Only when the mark was already very close to the median, it was clearly visibile on the left side of the track. It has been identified by chalking it. From km 8.5 until km 8.9 not the faintest mark was visible". From the same Police measurements, we know that the clearing was from km 8.825 until km 8.919: if the sidewind trough it triggered the accident, what was Jacob looking for so far ahead of the clearing itself? And what about the contraddiction between a "faint and barely visible" mark and those words: "Not the faintest mark was visible"? Puzzling is also the affidavit by Wilhelm Sebastian, because two documents, both signed by him, actually exist: the first one, dated February 10, is longer and more detailed. We understand that he wasn't at the start of either Run 2 and 3: he was already in the passenger car, together with Eberan, driving to the other end of the track. Nevertheless, he writes that the body of the record car was in a perfect shape, only the engine was reported by Rosemeyer to be down on power. Then, something happens inside AU power rooms because, on February 15, Wilhelm Sebastian signs another, shorter document(*) saying that he knew Eberan's February 11 memo, had read Dr. Feuerreissen affidavit, and "fully agreed with their words". No more mention of him checking the car before Run 3, as he instead duly reported in the first document. A moving addition to the second document are Bernd's last words. In German, they are: "Wilhelm, Du kannst versichert sein, ich merke es alleine, wenn es nicht geht. Ich will nur noch einmal rantasten". Translation: "Wilhelm, be reassured, I can figure it out on my own if it doesn't go. I'll only try once again to approach it (the record speed)". The words were also reported by Jacob(*): "Ich will nur nochmal die Fahreingeschaften pr�fen, ohne etwas zu riskieren und will mich nur nochmal rantasten". Translation: "I'll only test the driving conditions once again, without taking any risk, and I'll only try once again to approach it". Look at the difference: "I can figure it out on my own if it doesn't go". A few words that make a big difference: they conveniently supply evidence that it was Rosemeyer's own decision to start Run 3 in such windy conditions, despite all efforts by the team principals to stop him. He made the wrong decision. Dead people have no second chance. The 1938 record car was profoundly changed since October 1937, not only in sheer weigth and body shape. Its dynamics were totally different due to the upper fairings moving the center of pressure (CP) to the front, while the center of gravity (CG) was slightly pushed back by the very heavy ice tank. A CP too close to (or ahead of) CG makes for an unstable layout, i.e. the car will magnify the effect of a side force applied to it, thus further deviating from its trajectory, instead of self-adjusting itself back into the right direction. Such a worsened lateral sensitivity came somehow out of wind tunnel tests. We could guess that the decision to maintain the water radiator, even if totally useless, was due to the need to have more weight on the front, to balance the added mass behind the CG. To keep useless mass on board a racing car is, usually, a sign of sheer madness in a designer, but there was some method in doing so, as in placing the 30 l fuel tank on the front axle. Nevertheless, the explanation given by Eberan for keeping the front intake wide open and the radiator in place: "To cover up the fact that we, too, used ice cooling"(*) is puerile and it looks like an offense to Mercedes people, bystanders, and readers. Ditto for the use of the metal plate to reduce the front air intake in Run 3, as explained in Eberan's statement of February 14(*). From the wind tunnel measurements (which appear to have been taken with an unrefined methodology, due to lack of time and the pressure of season holidays) they knew that the car was unstable when hit by a sidewind and they also knew that the rear lift was significantly lower than the reference value (i.e, the 1937 Stromlinienwagen). A success, in terms of drag reduction, yet higher rear adhesion, through downforce, and a CP too close to (or ahead of) CG are a sure recipe for longitudinal unstability. And they knew it. Furthermore, the data read on the model in the wind tunnel were not calibrated in the real world: the wind tunnel tests produced a set of differences between the old and new body, but nothing was known or measured about actual forces acting on the full-size car. The affidavit that poor Hasse had to sign after the accident(*) confirms that no serious test of the car was made before January 28 runs: time was running too short. No one would believe in such an ex-post facto statement by an employed second-rank driver: "(The new body) has a better stability and (the car) goes like on rails", as he wrote about an easy shakedown on January 23, strictly following the orders not to exceed 4,000 rpm in fourth gear, through a mild breeze. Lack of time could have been the driving force for selecting the option to bolt such thin (1 mm aluminum sheets) upper fairings without any cover at the junction with the body at the apex of wheel fairings. A close-up photo of the car before Run 1 already shows a gap of about 1-2 mm at the junction of the left upper fairing with the left front wheel cover. It faces the airstream and, at speed, it would act like an air intake, without outlet. If the junction was already so loose before the stresses of high speed and the bumps along the road, it could have only worsened at the start of Run 3. Tightening the mounting screws further enhanced the wavelike warps on the side panels. A very detailed and professional letter by the Stuttgart-based Patent Office W. Keller(*) adds that: "It could also be a viable option (to explain the accident) that the warps (in the right upper fairing-see above) could have widened so to blown off the fairings, let airstream pierce through the inside the body and the induced pressure force the cockpit cover to be torn away"
Eberan, in his February 11 memo, writes in 30 lines an accurate description of the escape outlets of the air passing through the front intake and the radiator. They could only having been located in the driver's compartment, on the floorpan. A photo published by German dailies(*) shows an undamaged piece of the lower body, which fits Eberan's words. There are 3 + 6 triangle-shaped openings: the former could be the ones operated by the driver, the latter the old ones, now shut using the 2 mm dural sheet mentioned in the memo. The piece lays on the Autobahn concrete without any black mark visible: we have to assume that the photo was shot at a location ahead the beginning of the skid marks. Keller wrote(*): "Some eyewitnesses, who reached the site immediately after the accident, said that the windshield protecting the driver has been found in a place which may be coherent with it having been blown away before the accident. ... If this was the case, the accident should have been triggered by such an event". As possible explanation of the accident, one can immediately discard transmission seizure (tyres were nearly intact on the wreck) and ice tank blast (it could be seen, battered but still in one piece, on the left of the wrecked chassis). The combination of unstable vehicle, weak and overstressed body, and sidewind holds the key to understanding the accident. Let's explore the following sequence of events. The trigger could have been the pressure differential between the inner body and the chanelled airflow under it, either raised by the longitudinal component of the sidewind or not. Such a differential, overcoming the structural boundaries of the vehicle, sucked away the plate holding the closed outlets. It's difficult to think of the windshield being torn away at that stage: Rosemeyer should have been beheaded. Due to its lightness and shape, it's likely that, flying high still on the car, it could have been taken in the stream above tree tops and forced far back. The latest moment for it being jettisoned is when Bernd was thrown free of the car. Instead, right there, the car suddenly lost most of the downforce, which stabilized it along its trajectory. We may also assume that the plate could have damaged the underpan and the lower rear fins, further reducing downforce. Rosemeyer had already the car slightly pointing to the right and, having sensed the approach to the clearing, either steered more to the right or lost some hundreds of a second pondering on the loss of the plate with the accompanying noise, like an explosion. Due to its instability, the car aimed, tail first, to the left and began to skid, while the very high speed (about 430 km/h) dampened the rotation. The rear left wheel hit first the median grass, 38 m (0.32 sec at 430 km/h) after the beginning of the black mark left by the left wheel skidding on the track. The mark starts at the end of the 94 m long (0.75 sec) clearing in the trees (let's call it point zero). It's more likely linked to a countersteering than a braking action. When the left rear wheel went on the softer grass, both right wheels were raised off the ground enough to let all air escape from the underbody, thus zeroing downforce. The right wheels, looking at the drawings of the Police survey, never touched the track again: they are intact on the wreck. Hitting the picket in the grass median, if it ever happened, is irrelevant at any point of such a sequence. In the next 48 m (0.40 sec), the car widened the angle of skid, with the tail pointing more outward (i.e more towards the left), thus giving the impression of coming back onto the concrete track. Rosemeyer could have countersteered to aim through the bridge without smashing himself against the centre pillar. Such a move is routine for a racing driver, yet it didn't have any effect because of the limited angle of steering allowed by the closed front wheels. Due to car's instable layout, it only worsened the skid. Maybe, to better aim the car, he also braked. Surely, he sensed that traction was lost and the car was going sideways beyond control. The instability of the car, the higher resistance by the grass on the left rear wheel, and (may be) the countersteering and braking action on the front left tyre (the only one on the concrete) pushed further outward the rear of the car. After about 90 m. (0.8 sec) from point zero, the rear left wheel came back on the track broadening the angle of skid. At 120 m (1.1 sec), the front left wheel, overloaded by the skid, collapsed and, from an angle of about 50� to the nominal direction of motion, the car left the ground pivoting on that wheel. That was the end. After two somersaults, the stripped chassis slided and stopped, upside down, on the banks of an overpass, 473 m from point zero. Bernd's body laid in the woods, 23 m from the outer edge of the Autobahn, 366 m from point zero. He was ejected from the cockpit in the second somersault. At point zero, he still had less than 5-6 second to live. The upper fairings could have been blown away when the car was still on the ground or already airborne: the scenario doesn't change, while such an explanation for triggering the accident appears less likely than the sudden loss of downforce because it shouldn't have had such immediate and devastating effect. Furthermore, we have to trust Jugel(*). If the fairings or the windshield were torn away on the ground, Alfred Neubauer should be praised for having seen right in his explanation of the accident(*). In short: Rosemeyer's fate was written on the wall when the body of his Stromlinienwagen collapsed. The SW wind through the clearing could either have added that extra load on a body already blowing apart or be uninfluential. The car was travelling beyond its dynamic and mechanical envelope, bound to destroy itself, even without the wind. It wasn't designed and engineered to withstand the stresses of an untried speed. AU wanted to go faster than their competitors. Faced with the pressure of meeting the objective, they didn't care to open the perilous world of downforce, and exploit ground effect 40 years before Jim Hall and Colin Chapman, yet they didn't have the know-how, tools and materials to tame and control it. Furthermore, the 1938 Stromlinienwagen lost Dr. Porsche's advice at the time of transferring his ideas into the actual car, was hastily built, untested, badly managed in the record runs, and someway damaged at the start of Run 3. Bernd Rosemeyer had been appointed to a rank in the SS organization, Hauptsturmf�hrer, to honour him and to exploit a hi-image person. Such a rank could also have acted as a shield for his well-known non-aligment with the Nazi orthodoxy. His death triggered a set of condolence messages, some of which are in the final pages of Elly's biography(*). It's a Who's Who of many of the most infamous criminals in the history of mankind: the top ranks of the Nazi party listed in order of importance. Friends of the racing community sent Elly simpler telegrams, not mentioned in any book or article: Nino Farina and Enzo Ferrari among the many. On February 5, Auto Union was, at last, ready to mail Elly, "Dear and highly esteemed Lady" a formal condolence letter(*) ending with an uncommon "Dear, brave Ms Rosemeyer, we renew our loyalty into loyalty", such a piece of art for any public relation officer, and so finely tuned to be delivered one week late. Bernd's funeral on February 1 at Dahlem Cemetery in Berlin was a macabre show of the best the Nazis could stage for a national hero, dead for the glory of the Party and Germany: SS and Auto Union shared the scene, with Daimler-Benz's top drivers and managers also duly showing. Beethoven's funereal march and the SS loyalty hymn "Wenn alle untreu werden" gave the last farewell to the coffin in a triumph of Nazi salutes. The guard of honor was provided by the elite corp Leibstandarde Adolf Hitler. No mention has been found on Elly leaving the open grave as Nazi dignitaries and Direktor Bruns of AU spoke their eulogies: it would have been a rebelious move, unthinkable for such a person in such a society. The moving valedictorial bylined "Your friend Rudolf Caracciola" was widely published in German newspapers(*), as well as the rather unusual half-page obituary by Auto Union(*). Once the Nazi pump was over, some mundane tasks were still to be completed: internal AU memos(*) recap the cost of insurance and funeral. The former amounts to 67,500 RM(*), to be paid to Elly, also for two months old Bernd Jr., and the latter to 2,756.75 RM. Poor Berndt had been barely laid in the grave when August Jacob reports(*) on a conversation with SS Oberf�hrer R�sener in Berlin. Being the late Bernd Rosemeyer a SS officer and an AU racing driver and employee, would SS agree on sharing the cost of the funeral? AU would pay all the bills, and provide the SS with "detailed documentation" allowing the refund of 50 per cent of total expenses. These are the facts. Those were the times, those were the men. The same men who sent Bernd Rosemeyer on the Reichsautobahn, that morning, knowing well that no national glory, no company pride, no designer's ingenuity, no driver's skill could ever overcome the laws of physics and aerodynamics. 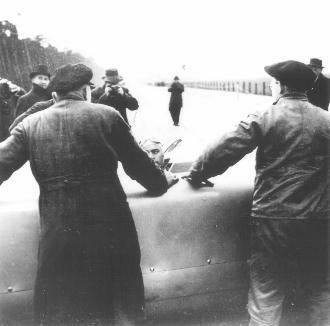 Bernd Rosemeyer was a dead man when he climbed into the cockpit of that car, on Friday, January 28, 1938. May the blame of such a loss stay with those who let him go. (*) The author is, as a side job, a motor journalist and historian, member of Aisa-Associazione Italiana Storici dell'Automobile, Sah-Society of Automotive Historians, Speed Record Club UK. 1 From a 1938 report. The actual speed was in fact 429.6 km/h, 1km/h faster than Caracciola earlier that day.